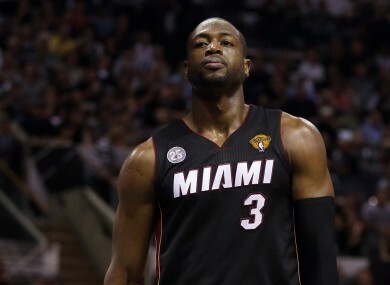 Dwyane Wade: the Heat's star man. THE PHILADELPHIA 76ERS play the Miami Heat tonight in a battle for Miami’s 2015 first-round draft pick. The situation is simple: both teams have to lose. Miami originally traded its 2015 first-round pick to Cleveland in 2010 as part of the LeBron James sign-and-trade. Last summer Philadelphia acquired the pick from Cleveland as part of the Kevin Love trade. The catch: the pick is top-10 protected. The Heat keep it if it’s one of the top-10 picks in the draft, but Sixers get if it’s pick No. 11 or later. Right now the Heat– who were eliminated from playoff contention on Tuesday — have the 10th-worst record in the league. If they lose to Philly they will stay in that position, and will have a ~90.9% chance of keeping their pick. If they win, things get more complicated. Brooklyn is one game ahead of Miami in the standings. If the Nets lose to the Orlando Magic on Wednesday and the Heat win, a coin flip will decide which team is 10th and which team is 11th in the NBA Draft lottery. Based on the lottery odds, the Heat would only have a 2.9% chance of keeping their pick if they lost that coin loss to the Nets and finished 11th. If Miami wins, they need help to keep their draft pick. Either Brooklyn has to beat Orlando, or Miami has to win the lottery coin toss. What makes this game doubly odd is that the Sixers want to lose too. Not only will it dramatically improve their chances of getting that Miami pick (as detailed above), it could improve their chances of grabbing the No. 1 pick in the draft. Right now Philly has the third-worst record in the league, one game behind the New York Knicks. If the suddenly hot Knicks win again on Wednesday and the Sixers lose, they’ll move into a tie for the second-worst record and have a better shot at getting the top pick. Email “Both the Sixers and the Heat want to lose tonight in the weirdest NBA game of the season ”. Feedback on “Both the Sixers and the Heat want to lose tonight in the weirdest NBA game of the season ”.